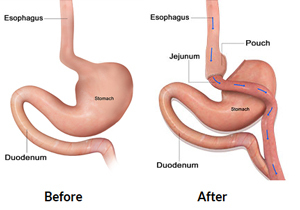 Laparoscopic gastric bypass is performed under general anesthesia. Your surgeon makes 4 to 6 small keyhole incisions. A laparoscope (tube with a light and a miniature camera) is inserted through one of the incisions. The camera is fixed to a monitor, which allows your surgeon to get a magnified view of the operating field. Surgical instruments are inserted through the other incisions. A small pouch is created by stapling the upper part of the stomach or by using a plastic band. The smaller portion of the stomach is then attached directly to the small intestine. The incisions are closed with sutures.